Joe talked about Genesis 1 and 3. The fact that for so long the church has allowed their story to start at Genesis 3, when sin comes into the picture. The problem is, when you do that, the entire gospel becomes about getting rid of the problem that is presented at the beginning of the story. However, the story does not start there. It starts with Genesis 1, and when you start in Genesis 1 the story begins with God creating humanity in relationship with him and in relationship with each other and in relationship with the world. That is what we have to look forward to. This part of secret information has basically lead us to believe, that if we don’t have this information (ie. that we have to invite Jesus to live in our heart), that we will end up in a place that we call hell. So that is what this week is about: hell. We are going to go through all the words for hell in the Bible and gain some understanding on people’s belief in hell and try to come to grips with what the Bible is doing with such a concept. Before we start though, let’s find out where we all are presently. Joe is going to come up and mind map all of our ideas, but basically we want to create a map of all the beliefs of everyone in this room and what hell is. Q: What is hell? How do we know what hell is? Why is it important? Everyone has very different ideas on hell. One of my favourite musicians, David Bazan, kind of gives his own take on it, so we asked Kevin to perform it for us and I’ll put the lyrics on the screen so you can follow along. In what medieval kingdom does justice work that way? I’ve read a number of books on hell and heaven in the past year and if I’ve realized one thing it is that there is tons of different, possible views of the afterlife and especially hell that all come from different honest, Jesus loving Christians. You will not agree with all of them, because these views are all contradicting. What we are talking about here is the Christian churches’ best guess after years of honest study, reflection and prayer. Theologians, scholars and God fearing men throughout history have wrestled with the idea of hell and many of them have come to different conclusions. In some cases hell is believed to be retributive, a type of punishment for being sinners. Some believe that God simply chose some at the beginning of the world to go to heaven and some to go to hell, this is called the doctrine of election and would be held by many Calvinists. Some people believe that everyone has a choice and that some people freely choose to go to hell. Some believe its actual literal fire. Some believe no such place exists Some believe it’s God eternally separating himself from sin. The list goes on. As we can tell from this mind map, even in this room there is contrasting opinions. I have a lot of problems myself with the traditional view of hell. The traditional view of hell that I was raised to believe is that there is an afterlife, and there is only two places you can go: heaven or hell. Depending on if you’ve accepted Jesus Christ as your Lord and Personal Saviour is the sole determining factor on which place you end up in. Of course, this view is extremely one sided, only half biblical and barely takes into account all the problems people have with it. What possible finite human or crime is capable of committing that would be justly punished infintely in firey torture? Am I really supposed to be happy in heaven when all my loved ones are tormenting forever in hell? Free will can’t be altered ever? Even if they are so destroyed by sin that they can’t think clearly and properly? Wouldn’t a loving God interfere to set them in the right direction as to not be tormented forever and ever? Is this not more loving than giving freedom? What do you do with all the verses in the Bible about reconciling all things and all people being justified? If Jesus says forgive them for they know not what they do, why are they held responsible if they don’t know what they are doing? It’s like giving a 6 year old a gun, is it really a freedom worth having or is it a setup for failure for a horrible failure kind of like Bazan talks about in his song. Why is death the last chance? Why is the Heaven’s Gates and Hell’s Flames the accepted view on what happens? Who says hell is eternal? The list goes on and on and I’m sure if you were all honest with yourselves you could add to it. But here is what we need to understand before we dive into a topic as heavy as this one. The difference of opinions on this matter does not say anything about someone’s commitment to Christ, to the Bible or to their faith. If you are sitting there thinking well sure you can believe in universalism, but that’s just because you have a low view of scripture well then you are sorely mistaken and you will never be able to enter into a healthy dialogue on the subject. There are good God loving and Bible respecting people who come to different conclusions than you do on topics such as these, and we have to allow it to happen. This is a crucial understanding before we start anything. We all agree here that the bible is inspired and it is unerring to its witness to Christ. This does not mean the way that you read the bible or the way I read the bible is inerrant also. If we can come to that agreement then we can move forward. Hell is a touchy subject within Christian circles. Oddly, it has become a central theology to the Christian faith. It has slowly creeped it’s way into becoming one of the sole tactics that Christians have to make converts and raise their children. Just last this week I was hanging out with the families in my Circle group and a mom of two young boys told me that her seven year old some came home from Catholic school telling her that at school he learned that if he was bad that he would go to hell. She had to assure her son that if that was the case then she wouldn’t be around because she has done a lot of bad things. So what happened? Why are we here right now? How has hell got to a point where it is so important in our day to day lives? How come the only time I hear about hell its used to threaten? The belief in hell is important and how we believe in hell also says a lot about our belief in humanity, God and grace. Hell is important and it will tell us a lot, but your salvation or participation in the church doesn’t require you having the right answers to this mystery. So let’s see where our beliefs in hell come from and where maybe we should land closer to. We should probably start at the beginning and we can figure out a healthy balance on where we should land on such a topic. Let’s keep in mind that I can only cover so much, so this sermon should be looked at as inspiration to go and seek God and the scriptures for truth. Don’t stop thinking about this after this message. A large chunk of our Bible does not mention hell at all: the Old Testament. In fact, the OT doesn’t really have words or use for words like heaven and hell. The OT has no concept of an afterlife that is split up. The OT uses the word sheol when referring to where people go when they die. Those in the OT had no idea of a soul living after death. The concept just did not exist in their writing. Their understanding was that in the same way that they were created from dust that they would return to dust. All dead go to sheol and go to sleep together, not just the bad ones. Basically sheol is the negative of life or being alive. There is no idea of reward or punishment or judgment; it is just nothing. There was no coherent system of belief of the afterlife and what happens. The afterlife was simply not something that was talked about very much. Sheol was the closest you got. So if we want to form a healthy theology of hell, the Old Testament doesn’t give us much to go on. A few hundred years before Jesus is probably when a understanding of hell as we know it today started to evolve. This started happening when good Jews were being martyred. Imagine a foreign king coming and conquering your land and the soldiers kill this good, Godly woman brutally. People started needing answers for this type of brutality. Because if all you get for following God closely, is dying a horrible death at the hands of your enemies. Jews eventually came to the understanding that if this is how it plays out now, well then there must be some way that God fixes the situation on the other side. Imagine entire villages being raped and brutally tortured and then to top it all off they are killed. There has to be some sort of retribution for this right? Something has to be set right. Now we talked about how some of the Psalms are from the oppressed and this is why they can sound so violent and desperate. It was out of this oppressed state that a theology of the afterlife was formed. It was only natural. If they believed in a good God who loved his people, then there must be something else than simply living, getting beat up and dying in the same place as the people who were doing these things to you. Justice is a necessary belief for anyone who has ever suffered. It is a necessary belief for anyone to live peacefully. The doctrine of judgment helps us live at peace in the world. So longing for justice is what came out of the oppression of God’s people, it is the belief that God will eventually set things right. It is the belief that judgment will be rendered and every time you have been wronged will somehow be set right. I think that this is a fair desire, I just don’t think hell as we know it today is the answer to this dilemma. I think judgment is. This is the type of judgment that we read about in the Psalms; this longing for God to bring justice and make things right again. Israelite scholars now have this view of judgment, it is something that becomes more and more accepted. Justice is common language for them. Crying out to God for refuge and to take down their enemies was their way of dealing with horrible oppression. Like any theology over time it becomes taken advantage of and used to induce fear into people that they are speaking to. They take a natural longing of justice and turn it into a fear tactic into scaring people into living the right way and controlling them. So you have an entire sect of Jews, the Pharisees, who then start using this concept of God’s justice to scare people into doing the right thing, or they will suffer the wrath of God in a place called hell. Do you see how this change of context changes the meaning of hell completely? In one circumstance, you have God’s justice being the last little bit of hope for the oppressed. In the next you have God’s justice as being a tool used to to scare people into living right. First you have judgment as being hope for the people being oppressed, then something changes and you have judgment becoming the tool to oppress the oppressed. When God’s justice starts getting used to force morality, it completely misses any idea of love and grace. Enters the New Testament and the Pharisees that we have read about all our lives. One of the major Pharisee beliefs is that the reason they were still under Roman rule is because they thought that there was too much sin among them. There was just too many prostitutes, drunks, tax collectors and other sinners. If they could simply make these sinners stop sinning then God would finally come in and save the day and end Roman oppression. Therefore, they start formulating a belief that unless you repent, ie. stop sinning, you’ll go to hell. After all, because of their sin, the marginalized nation stays marginalized and oppressed, so they will get the same fate as the oppressors themselves, because they are delaying the arrival of the Messiah. When we read the bible in english we miss a lot of the meaning behind the words that we are reading. Hell is a perfect example of how a lot of meaning is missed in the translations. It only appears a few times throughout the entire New Testament yet we have created our main driving force of purpose and theology behind this idea. Throughout the entire NT, there is three different words that we translate into hell. So already we have our first problem. The Greeks were using three different words and we translate each of those into the same word. It’s like calling Iraq, grave and casket all the word ‘death’ and making no distinction of the three things. Or let’s put it this way. This morning I was listening to CBC Radio and they were talking about all the little devils that have come up from Mexico and have landed on Vancouver Island. If I give you no context (and especially if this is thousands of years later) you probably would have a belief that these were actual demons coming to torment the Vancouver island. Now what if I told you that Humboldt squid were called little devils by Mexican fishermen because they were large predators and that oddly they are washing up on shore in Vancouver in the hundreds. See how the story could easily get mixed up? We know this is ridiculous but if we don’t get into the actual meaning of these words this is exactly what we are doing with the concept of hell in the NT. So let’s go through some of these words so we can understand what they are really talking about. tartaroō (2 peter 2) This is a term from greek mythology, punishment and disicpline of angels, only occurs once, peter borrows from the greek writing. We don’t need to focus much on this one because it shows up once in the entire bible and it has to do with angels. hadēs – This word shows up 4 times in Revelation, 1 time in Acts, Jesus uses it 4 times in Matt 11, 16, luke 10, 16. This word is the Greek equivalent of sheol. We’ve already covered this word in the Old Testament, this we know is the same word because the greeks translated sheol into hades. So that leaves us with one word left that carries some meaning that we need to focus on. gehenna – This word is in reference to an actual place, Valley of Hinnom (ga means valley). Every other mention of hell in the NT is referring to this word. 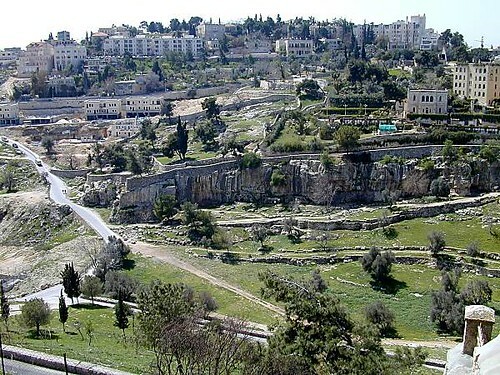 Gehenna was on the south side of the city of Jerusalem. So it raises the question, what does it mean? Gehenna had a real history, and it shaped the understanding of this word. This is where sacrifices of sons and daughters were given to Molech with fire. For a good jew this wasn’t a good place, things had taken place there that was the exact opposite of everything that God had planned for his people. This wasn’t really prime development property, this place just had this feel and stigma attached to it that made people stay away almost the same way that these kind of place have that type of stigma attached to it now. Basically mix the red light district and war grounds all in once place. So eventually what ended up happening was this place eventually got just used as a garbage dump. This place of course smelled horribly bad. You would go to the south side, to the wall of the valley and toss it over the wall to the dump below. Eventually the garbage would build up and then to push it back down, they would light it on fire so they could fit more there. Also, dogs in these days were not pets, they were wild, and the dump was a perfect place for them and they would fight over the food. When they would fight you would hear the weeping of their barks and their teeth would smack together. In other words, it was the weeping and gnashing of teeth. So Gahena was known as the place where the fire does not go out and there’s the weeping and gnashing of teeth. A place where things that once had value and worth were no longer useful and were tossed. The word was used once by James, every other use of the word is from Jesus (12 times). This is because when Jesus talked about it, he was talking about a literal place. This was a proper noun with a capital at the beginning. It was a real place that they all knew about. It was a present that had future implications. “If you keep living this way, this is where you will end up.” It was still a warning and it was still horrible, but that at least gives us an idea of where this imagery is coming from. 13″You are the salt of the earth. But if the salt loses its saltiness, how can it be made salty again? It is no longer good for anything, except to be thrown out and trampled by men. 21″You have heard that it was said to the people long ago, ‘Do not murder,[a] and anyone who murders will be subject to judgment.’ 22But I tell you that anyone who is angry with his brother[b]will be subject to judgment. Again, anyone who says to his brother, ‘Raca,[c]’ is answerable to the Sanhedrin. But anyone who says, ‘You fool!’ will be in danger of the fire of hell. 23″Therefore, if you are offering your gift at the altar and there remember that your brother has something against you, 24leave your gift there in front of the altar. First go and be reconciled to your brother; then come and offer your gift. 31″It has been said, ‘Anyone who divorces his wife must give her a certificate of divorce. '[f] 32But I tell you that anyone who divorces his wife, except for marital unfaithfulness, causes her to become an adulteress, and anyone who marries the divorced woman commits adultery. 33″Again, you have heard that it was said to the people long ago, ‘Do not break your oath, but keep the oaths you have made to the Lord.’ 34But I tell you, Do not swear at all: either by heaven, for it is God’s throne; 35or by the earth, for it is his footstool; or by Jerusalem, for it is the city of the Great King. 36And do not swear by your head, for you cannot make even one hair white or black. 37Simply let your ‘Yes’ be ‘Yes,’ and your ‘No,’ ‘No’; anything beyond this comes from the evil one. This is one hell of a heavy sermon. Listen to Jesus, he makes demands that I certainly have not kept and at the end of some of them the threat of hell is hanging over their heads. Then to top off the entire sermon, he says be perfect, therefore as our father is perfect. What? No wonder Bazan sang a song like he did. Matthew writes it like a list after list of demands of what is expected by them. However, I think there is some keys in verse 20 that might help us understand a little bit more about what Jesus is doing. This is a key line. Jesus is setting this entire message up basically saying that even the people that are trying to do the purifying; even the people who have it all together and don’t break any of the laws and are telling you what laws you are breaking and don’t even know it are at risk here. They are telling you that you will go to hell if you don’t repent? Well I am telling you that it gets even worse, your righteousness has to surpass even theirs if you think you have any chance at making it into the kingdom of heaven. Jesus is very particular when he uses this language. Jesus took the Pharisees threat of punishment and brought a present reality to it and start to deconstruct what they were saying. He is using such strong hyperbolic language that it makes the Pharisees look like idiots. Imagine, you have these Pharisees who for a few hundred years have been using the threat of hell to scare people into becoming pure enough so that their messiah comes back. Now, a so-called messiah steps on the scene and starts saying that even these teachers who have been correcting you are not entering the kingdom of heaven. In fact, if anyone is going to hell, it will be them. If you notice, Jesus is only talking to people who use this language already to throw it back at them. He is talking to people who are following him, people who have a concept of hell as a place where sinners go and then he flips it on them and says basically that if anyone is going to hell it is you people who are so certain that they know who is in and who is out. He isn’t saying that every person is going to hell. Instead, he’s hinting to a different type of system that determines on who ends up where, and it isn’t the system of the Pharisees. Besides the story of Abraham and Lazurus that Jesus tells, hell doesn’t really come up in any other context in the entire New Testament. Every time it is Jesus using the threat of hell to show how the people who use the threat of hell cannot meet the requirements either and far from understand it. With all that said though, there is some hope underlying all this. First, this tells me that the imagery of a fiery pit in the middle of the earth with people eternally tormenting forever and ever because they didn’t cognitively agree with our four spiritual laws might not be what is really going on here. We need to recover a right use of the language of hell. The point of the language of hell is not for punishment for doing something bad and it is not to scare us into doing the right thing. The language is used to show us what justice looks like and to show us how bad we get if we try to do it on our own. It is to show us what humans left to their own good intentions will eventually lead to. It will lead to a garbage dump of lives that have are only concerned about their own skin and themselves and no one else and trying to earn favour through their sacrifice. Hell is where humans build their identity on anything but God as Soren Kierkegaard puts it. Hell is a present day reality, and whose to say that it can’t be a future afterlife reality? Hell is a freely chosen identity based on something else rather than God as Tim Keller puts it. Hell is not punishment. Hell is not a pit that God throws people into that didn’t accept him as his personal saviour. When you picture hell, don’t picture all these people stuck in the middle of the earth begging to get out, trying to climb out and God up there saying, sorry buddy, no luck anymore, we don’t want you anymore. Hell is not a forced option, but freely chosen. Hell it seems, all through the New Testament, is brought on by an inability to accept the love of God and to live under the illusion that sin really isn’t harmful. If we look at Romans 1:18-32, we get a better understanding of what is going on here. It says that God gave them over to the sinful desires of their hearts. God just let them go and chase whatever world they wanted to create. There is basically then two kinds of people: those that say to God thy will be done and those who God says to them “thy will be done.” Those that are in this concept of hell either now or later are there because they choose to live their lives by their own rules and refuse to find their value in God. Hell is what exists when God isn’t around and humans try to make it on their own. The language of hell is used to describe what happens when you start to go in a direction that isn’t from God. Hell is the opposite of the Kingdom of God. Hell cannot be avoided by simply scaring people away from it. We’ve proved this over and over again with smoking. The cancer links are obvious, smoking is one of the most harmful things you can do to your body, it’s expensive and it smells bad. However, thousands upon thousands of people still smoke. Tobacco companies know that scaring them into the reality of how bad smoking it is won’t stop people from a life that they are addicted to. So sure, put the warnings right on the label, it won’t matter. I don’t think we can make the mistake and not believe that a place that is horrible (that we can call hell) exists and people are either now there or will end up there ot whether its a place or a reality we experience. The real question I think we need to ask is why? Why is there a place like this, and how does a place like this stay in line with a loving and merciful God? Hell exists to bring God’s justice and to set everything wrong back to right again. If there is one thing that is consistent about hell throughout the scriptures it is that hell is closely related to God’s judgment and it being a place that is the opposite of the kingdom of God. God is constantly taking hell and changing it to be the kingdom of heaven. God setting everything right again is at the core of the Christian story. Hell is all the places that God has not set right yet. Ever since Genesis 3 God has been bringing creation back to Genesis 1. God’s justice is what the entire story is about. Hell is not a punishment but a reality, and judgment is not a punishment but a setting things right. The entire NT is all about salvation by grace and then judgment by works. Hell is not related to salvation, but to judgment. Hell is not an easy subject to tackle especially in one morning. However there are a few things we can be certain of with the God that we follow when it is all said and done. Whatever hell is, we know that there are parts of it here and now that we deal with every day. And with our month talking about how heaven and hell intersect us here at earth it is obvious that hell has intersected all of our lives more than we care to imagine. The wheat and weeds are growing together and we are in the middle of it. We have talked quite a bit about looking for the mariage between heaven and earth. Discovering truth on earth today, bits of heaven. However the same could be true for finding hell on earth. Think about the world that we live in right now. Entire countries living in poverty because of the lives we live here in this country. The countries that struggle can barely make their interest payments. We spend billions on smart missles and atomic bombs and we tear down schools and hospitals. We charge for health care and we reward celebrities for being good looking. Could these be the signs of the times? We are truly living at hell intersecting earth right here and now. This isn’t just a far off reality that we should be trying to avoid at all costs by doing some ritual, this is a reality that confronts us every day. We can decide. Bring heaven to earth or bring hell to earth. This is a choice you have to make everyday. Hell is necessary for us to believe in a God of love and justice. If we are left to ourselves without God and we are never judged and we are never forgiven we will certainly only make this hell on earth worse. I was hoping to finish this morning by continuing on from Matthew 5. After Jesus is done talking about all the ways that we need to be more like him and how easy it is to fall short. He starts talking about prayer and tells us this is how we should pray. but deliver us from the evil one. [a]’ 14For if you forgive men when they sin against you, your heavenly Father will also forgive you. 15But if you do not forgive men their sins, your Father will not forgive your sins. Thank you for posting this. It is very difficult to find even-handed remarks on hell using scripture. The last quote form Maundet summarizes it very well. We are often looking for one black and white answer (to the point where we will ignore other biblical voices that disagree with us). The only thing I disliked was this line, “We serve a God that was willing to die so we didn’t have to.” I don’t think this correlates with what you talked about, and I also think that Christ died in such a way that we would also die. Christ’s death, his giving up his life, is always and will always be a model for the Christian. He died so that we can also die. I really liked your commentary on surpassing the righteousness of the pharisees. It was quite good and quite on point. Thanks so much for sharing this. Danny, thanks for the comment. When I say God was willing to die so we didn’t have to I mean he suffered the penalty and the inevitable end to our sin. He accomplished a specific role that I cannot accomplish through my death. This in no way is insinuating that we still don’t have to die to ourselves daily. We follow Christ to his death. I especially like the section about those that buy into the cycle of ongoing retribution – if you buy into it, you must not believe in a God that will put everything right. Great post. thanks for posting this nathan. it was a well-researched sermon that stimulated my heart and mind. i definitly feel moved to keep thinking and learning more so that i can unlearn so much of what i have been taught and assumed to be true about hell. your community is blessed to have you teaching. I repent for my lengthy post… and I repent I didn’t read all of your’s… it looked like a good read tho. I’ll check out some of your other posts next… from Canada too eh? Really enjoyed this, Nathan! I honestly didn’t know (or really consider) the variation and meanings of terms in the Bible that were translated to mean ‘hell’ as we understand the term. The Gehena one was especially interesting to me. All that lake of fire business we hear so much about so often. I always wondered myself if our traditional Christian view of hell as an eternal punishment (demons with pokers) was in some small way influenced by mythology…that is to say, mythological, pagan views imposed on scripture throughout time (sheol translated to ‘hades’ brought bout many a mythological understanding of the reality of hell, I’d assume. Unfortunately, it seems to have morphed into a model we actually accept!). Seems to me that it’s more of a stew of mental images from flawed translations, power plays by religious authority, and plain old ignorance. Definitely has gotten me thinking.